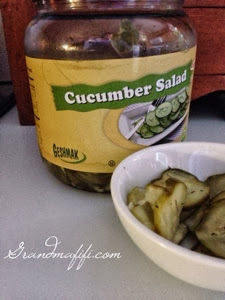 I've been seeing Geshmak Cucumber Salad in the refrigerator case at Costco and making myself wait until we finished our gigantic glass jar of dills. Finally, I have the Geshmak. The taste is slightly sweet, with garlic and dill. According to the label, 1/2 cup is 50 calories. I paid $6.99 for 54 oz. at Nashville Costco. After spending time decoding the label, I learned that the pickles are kosher. (The U inside the circle means kosher. I thought maybe this had something to do with Underwriters' Laboratory, although that seemed like overkill for pickles.) The pickles also say Kosher Parve, which means kosher for either dairy or meat. Geshmak is yiddish for "tastes great!" The BPFoods symbol on the label was mystifying; I could not find BPFoods anywhere on the Internet. The www.bpfoodgroup.com website that the label references does not exist. I tried looking up Geshmak Foods but didn't make any progress. I called the phone number on the label. After many rings, an unidentified voice asked me to leave a recorded message. No company name was given; it sounded like someone's personal voice mail. I like the pickles, I like Costco. I think these are a little mysterious.